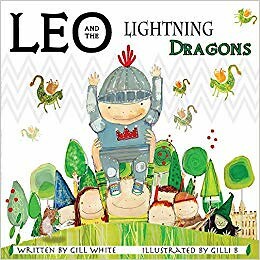 Leo and the Lightning Dragons is about a real boy called Leo, written by his mother Gill White, and illustrated by Gilli B. ‘Both’ the Leos have a very bad kind of epilepsy, and I can see why Gill would want to put this in a book. When your child has daily health battles, it can be good to know there is a book about you. Makes you feel special. And if you’re not Leo, you might have some other kind of illness, or epilepsy, and it’s empowering to find yourself in a book. Or there is nothing the matter with you, but it’s good to learn how other boys, and girls, live and fight. I was a little worried this wouldn’t work, but it does. It’s a lovely book, showing just how much fighting some people have to do on a daily basis. And how the people around them also have a fight on their hands, and how everyone works very hard to make this bad thing better. First we learn that an epileptic attack is like crackling lightning inside your head. It comes without warning. Not fair! Neither witches potions nor calming songs help. Wizards have tried to poison the dragons. In the end Leo gets angry and decides to fight back, which is easier to do when so many people are helping. This is obviously a really tough situation, but it shows that it’s possible to keep going. I’d like to think this will provide support for many little Leos out there.